This adorable little vintage evening purse has a baby pink fabric (probably acetate) backing and a gold-tone rim and bypass closure. Eden added the 31 3/4" long multi-link vintage gold-tone long shoulder chain. It has a bright pink fabric lining with a little padding behind the lining. 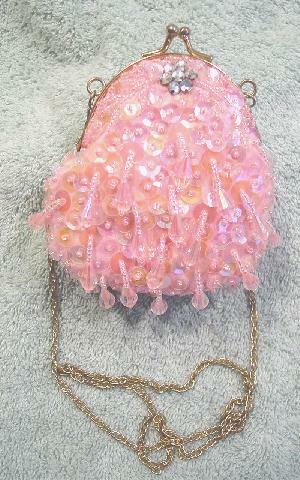 The exterior is covered with two sizes of iridescent sequins with a little pink bead in the center of the smaller ones. The larger ones have six tiny pink beads dangling from each center with a large teardrop pink bead at the end of each. Along both sides of the rim are rows in a scattered pattern of tiny pink beads. Near the top center on each side are seven faux rhinestones. 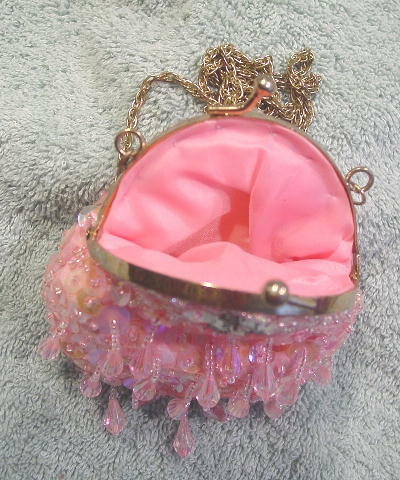 It will hold credit cards, lipstick, a small mirror, house keys, and money.